This booklet functions as an introduction to the Asian American Movement in New York in the 1970s and 80s, an exhibition catalog for the show of the same name at Interference Archive, and as a poster-sized timeline of the history of the movement. The catalog part contains an introduction by curator Ryan Wong, a glossary of key movement organizations, five anecdotes from interviews with movement activists and artists, and eleven images of movement culture (four posters, three publication covers, a mural, a political graphic, and two photographs). 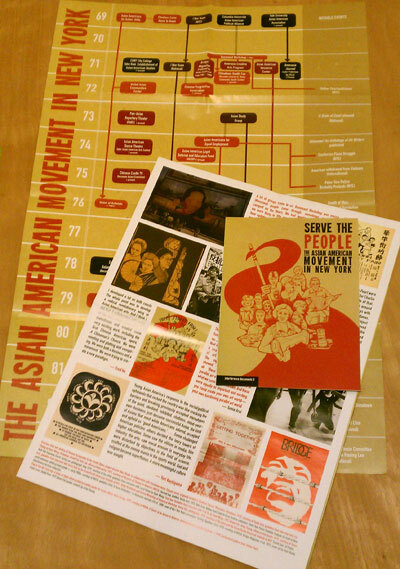 The back side of the brochure unfolds into a 20″x30″ timeline/poster which charts the history of the Asian American Movement on the East Coast. This is an important document of a major social movement in the United States which has virtually unknown outside of the individuals and communities which participated in it.